The Winnipeg Free Press has just announced that their Hustler and Lawless sports radio show is changing time slots - to 4-6 PM, and changing stations - leaving CJOB to join CFRW. Bob Cox is thrilled the FP will be a "full participant" allowing the FP to sell radio time as part of their ad packages. the general manager of CFRW, Chris Stevens, who sits on the "executive committee" of Kick-FM, deciding to cancel our show on 92.9 Kick-FM and then putting a Free Press call-in program in the time slot he threw us out of, on his own station. Nonetheless, good luck to Hustler and Lawless, who were very good friends of TGCTS and our efforts to promote the Kerry Brown Memorial Wrestling event in 2009. 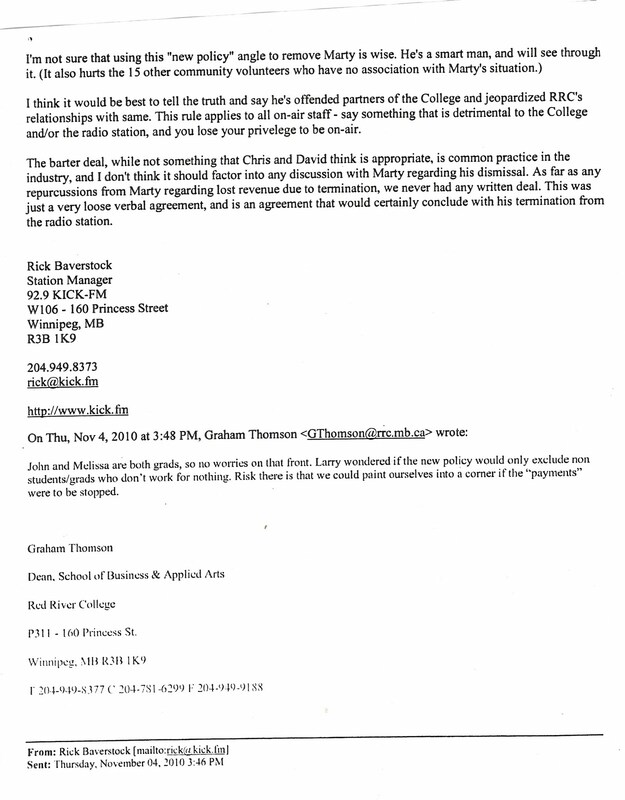 On Friday November 5th, vice-president Cathy Rushton declared there were "aspects of censorship that are relevant" to justify Red River College hiding behind the Kick-FM "executive committee" to cancel The Great Canadian Talk Show. College officials had been directed by RRC president Stephanie Forysth to find a way to eliminate the show, after a false complaint was made to her by Winnipeg Free Press editor Margo Goodhand. All weekend long, word of the decision spread throughout the city, despite Goodhand's request that her attack on Marty Gold be kept confidential. "I just got a call from the Winnipeg Police Association, who heard something about "Marty's possible termination" at City Hall this morning ... I asked Mike Sutherland (who called from the Police) to send me his concerns via email. As soon as I receive it, I'll forward it you." Sutherland's email arrived within 15 minutes. "I was recently advised today of the potential for the cancellation of the great Canadian talk show purportedly as a result of a complaint from a Free Press reporter. I must advise that the Winnipeg Police Association is greatly concerned about the cancellation of the show for a number of reasons. It is the only radio show the association has provided long term sponsorship for in recent history and we do so for a variety of reasons." - "to silence an important voice in the spectrum because they dared to be critical of the Free Press is in our view significantly alarming"
- how city hall and the police union had heard about the no-longer confidential link between the cancellation and the Free Press, blowing the cover-up story 3 hours before it had even been floated. - the importance of TGCTS enabling student journalists to develop a positive relationship with the police. - the platform the show provided for the community to discuss important policing and safety issues. 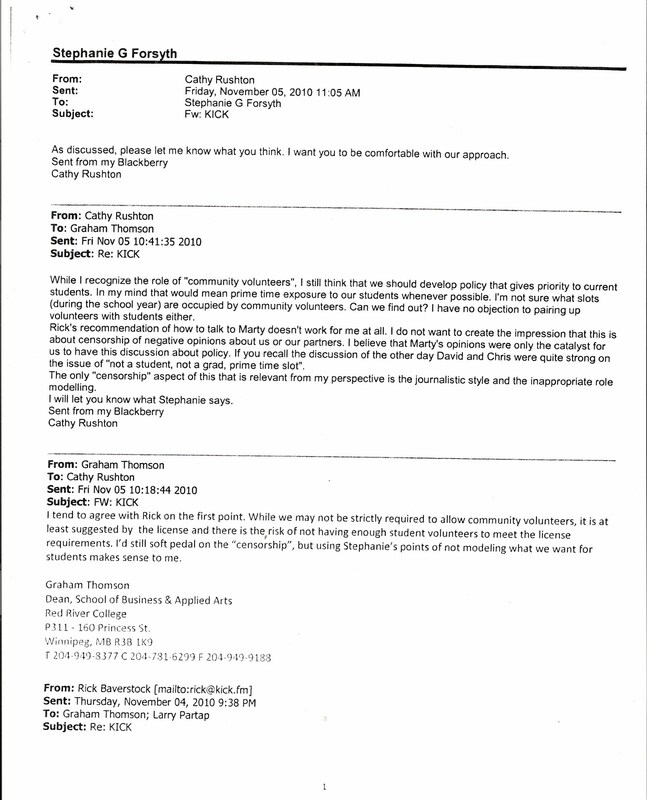 Instead, what Cathy Rushton commented on, was why the email protesting the cancellation had been sent at all. "Another example of what appears to be Rick lobbying for support." 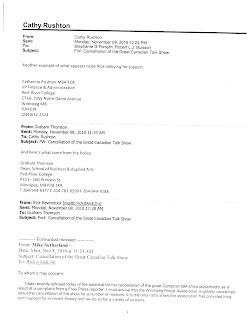 When a Freedom of Information filing uncovered Rushton's smear of the police union, Mike Sutherland emailed RRC President Stephanie Forsyth "to formally indicate our strong objection to a patently erroneous representation of our motivation". I am corresponding with you in order to clarify and correct any misconceptions you may have about our concerns as expressed to kick fm station manager Mr. Rick Baverstock, in relation to the cancellation of the Great Canadian Talk Show, as well as to formally indicate our strong objection to a patently erroneous representation of our motivation in that regard. I have recently been provided a number of emails as a result of a freedom of information request, some of which reference me and my organization specifically. 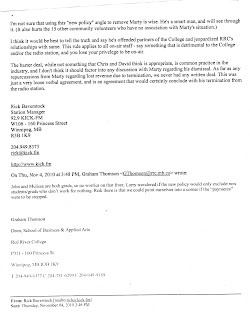 The particular email, to which I refer (and has been attached), appears to have been authored by Cathy Rushton, the Vice President of RRCC, and although some ambiguity may now exist, also a current or former member of the Cre Comm radio board. 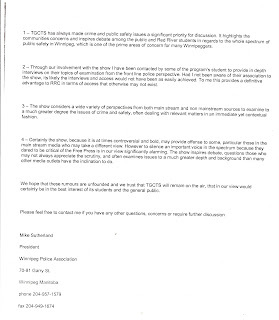 By way of background I can advise that the Winnipeg Police Association supported TGCTS. Upon learning of the show’s impending cancellation, which I can unequivocally assure you was not from Mr. Baverstock, I telephoned him as the station manager, presumably as he would have had a significant role in that decision. I then expressed my concerns and further followed up with a detailed email dated November 8th 2010. Let me absolutely clear, the expression of that concern was in absolutely no way recruited by or initiated by Mr. Baverstock in any fashion whatsoever. 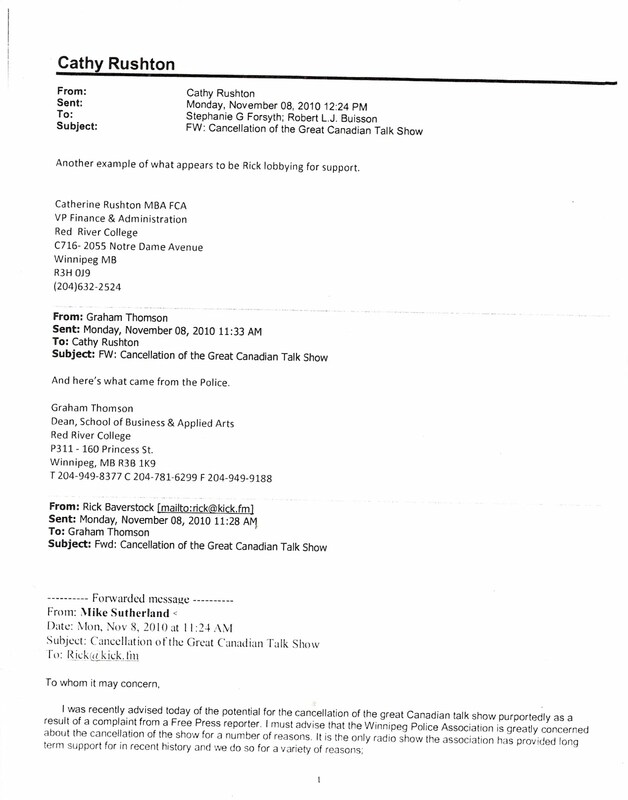 In fact an email sent at 11:10 am on November 8th from Mr. Baverstock to Mr. Graham Thomson, illustrates the nature of how our concerns came to be expressed. Mr. Baverstock requested the email from me at the conclusion of our phone conversation, which was initiated by me, simply to ensure the exact and detailed nature of my concerns during that discussion would be accurately and completely outlined. In our view, not only is this a clearly inaccurate representation of our motivation behind the expression of our concern, but it is quite conceivable that our real and significant issues, could be easily trivialized and therefore dismissed as manufactured, by those with the jurisdiction to consider the show’s future. I don’t recall ever having met Mr. Baverstock, and I can assure we have never participated in any alleged “lobby” purported to him. In terms of the categorization as arguably being recruited as pawns in this “lobbying” effort, nothing could be further from the truth. Furthermore one might hope that either Ms. Rushton who made the assumption, or you who received it, might have instead done us the courtesy of a quick inquiry, to determine if in fact the assumed premise was correct. You must appreciate that the receipt of the information regarding these communications is disturbing to us. We would have hoped to have at least to been contacted to seek clarification before dismissing or minimizing our concerns, the concerns of an organization that represents roughly 1750 men and women who risk their safety on virtually a daily basis to protect Winnipeg's citizens. We hope that this dismissive categorization was not the impression left with those considering the fate of TGCTS. I cannot emphasize enough that my communication was a sincere expression of our concern. It is disappointing to learn that it was portrayed otherwise. Dear Ms. Forsyth, I sent an email to you back on January 11th 2010. Although it did not invite a response I just wanted to ensure that you received it. I have included the original copy of the email below. I have as well attached the two emails that came to my attention as a result of a freedom of information request that I refer to in my discussions in that original email. If I could impose upon you to do me the courtesy of letting me know that you did receive this email, the previous email, or both, I would certainly appreciate it. Finally, in the only known response to any supporter of TGCTS that has contacted her about the cancellation, Stephanie Forsyth was forced to say ... something, while trying to say nothing. I am in receipt of your email of January 11, 2011. Thank you for taking the time to clarify and correct any misconceptions I may have had about the Police Association’s concerns regarding the cancellation of the Great Canadian Talk Show. We appreciate your efforts to keep misunderstandings on this subject to a minimum. Sutherland still wanted to make sure that Cathy Rushton or any other College official was never again left unchecked if, in the future, they decided to talk smack about the Police Association. Thank you for the reply and reassuring me that you have received my email outlining our overall concerns. Although cancellation of the TGCTS seems to be essentially a “fait accompli” I trust that any others with jurisdiction over that decision also had any misconceptions about our position similarly clarified. Although to some it may seem inconsequential in light of the result, the implication that we were “recruited” for a “lobbying” effort is troubling to us, not only as it is completely inaccurate, but suggests that the Association’s concerns as expressed were perhaps not sincerely held, but simply manufactured. As you can appreciate this view potentially undermines our reputation as sincere advocates for public safety and public safety education in the community, and therefore mandated we address it expeditiously. Should there be any instances in future where the position of the Winnipeg Police Association, as it may be associated to some activity or issue related to RRCC, is portrayed or categorized by someone other than those properly designated to indicate it, we ask that you, or the appropriate party from your executive, please not hesitate to contact me directly for clarification. This should alleviate any such problems in future, as we would be pleased to address any inaccuracies that may have developed. It is unfortunate that we were not provided a more timely opportunity to do so in this instance, but we were unaware of the categorization until we received the related materials. I thank you again for the courtesy of your reply and confirmation of receipt our concerns. 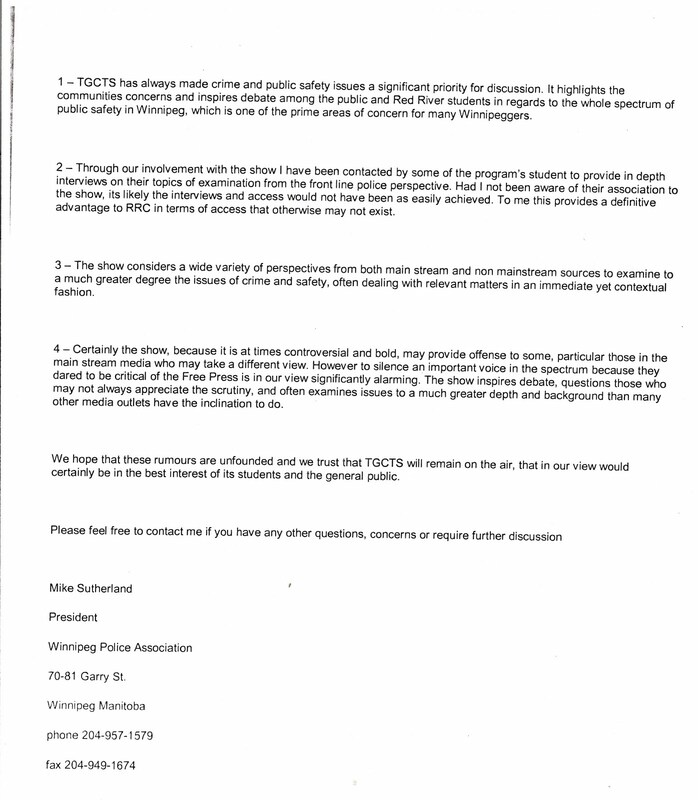 The Winnipeg Police Association email marks the third known incident in just the last half of 2010 alone, where supporters of The Great Canadian Talk Show were misrepresented in comments attributed to RRC vice-president Cathy Rushton that were circulated to other College officials. Rushton made a point last summer of mentioning "people whose opinions we care about". Supporters of The Great Canadian Talk Show and of freedom of speech are evidently not included in that group. to Mayor Sam Katz (who called her repeated claims he had complained about the show to the College "patently false"), or to Provencher MP Vic Toews (who denied he had ever complained about the show). Her boss, RRC President Stephanie Forsyth has, to our knowledge, not apologized to any of them either. Last Monday, the Winnipeg Free Press published a little - noticed editorial. After a week it had yet to be Tweeted or shared via Facebook. It will now be a less well-kept secret. In private, they embrace the very attack on free speech that they claimed in their editorial of February 7th to abhor. Here's what the FP editor did, when The Great Canadian Talk Show on 92.9 Kick-FM threatened the election chances of their preferred, NDP-backed candidate for mayor by exposing a scandal involving illegal NDP financing of Mynarski candidate Ross Eadie in the October election. Margo Goodhand phoned the new President of Red River College, Stephanie Forsyth to silence the show. And she wanted her call kept secret. Stephanie Forsyth immediately picked up the torch and the pitchfork and gave orders to kill the show. Her hatchetman -- RRC vice-president Cathy Rushton, who represented the "President's Council" on the Board of Directors of the radio station. Rushton had already taken one run at TGCTS prior to this. Another special interest group, the bike lobby, had tried to silence the show in August. Rushton went so far as to claim a nonexistent complaint from Mayor Sam Katz to garner support to have the show cancelled. But she failed. Oh, and she made sure to say she was "against censorship." " I'm not big on censorship at all but I think the CKIC Board needs to talk about our relationship with him. I'm not sure why we allow him to use the station as his soap box ." Note how the people most active in censoring free speech always want to make it clear they're against censorship. Well, this time she had her orders from her new boss. The only problem, was how to explain why the show was being cancelled, without admitting it was censorship to mollify the Free Press. Red River College officials tried one excuse (students need the airtime), then amended that to "students and grads only" as a loophole to allow the Free Press show on Kick-Fm to continue. But they refused to say the obvious. "I think it would be best to tell the truth and say he's offended partners of the College"
" Rick's recommendation of how to talk to Marty does not work for me at all. I do not want to create the impression that this is about censorship of negative opinion about us or our partners". 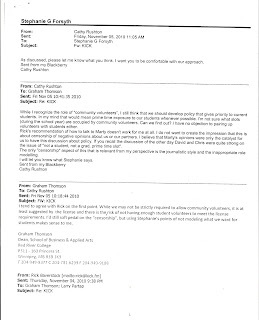 So Red River College officials kept lying, with Forsyth's approval. They lied to the National Post. They lied to the student body and station volunteers. They want you to know they were against censorship before they were for it. Just like the Winnipeg Free Press. And what did that Free Press editorial say ? "Freedom of speech is hardly worth defending if it means only standing up for what we agree with." Next: When a sponsor of the show found out what Cathy Rushton said about them speaking out against the cancellation, it forced Stephanie Forsyth out of her bunker.